After three decades, Warner Bros. has successfully resurrected its Superman franchise with Zack Snyder's darker, more violent take on the marquee superhero. Man of Steel, directed by Snyder and produced by Christopher Nolan, debuted to $125.1 million at the Father's Day box office to score the top opening of all time for June. That figure includes $12 million grossed Thursday night from special Walmart screenings, putting the actual three-day figure at $113.1 million. 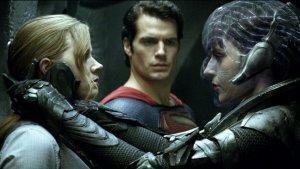 Either way, Man of Steel eclipsed previous June record-holder Toy Story 3, which debuted to $110.3 million in June 2010. Man of Steel is a notable win for WB and Legendary Pictures, which co-financed the $225 million tentpole. In 2006, WB and Legendary's Superman Returns did okay business at the box office, but not enough to mark a new chapter for the franchise. Man of Steel opens exactly 30 years after Superman III, the third entry in the wildly popular Christopher Reeve franchise. There was one more title in that series, Superman IV: The Quest for Peace, although it fell flat at the box office in summer 1987. This time out, British star Henry Cavill stars as Clark Kent, aka Superman, which sees his character trying to hide his superpowers and live a normal life on Earth. Amy Adams stars as Lois Lane and Michael Shannon takes on the role of the menacing General Zod. Russell Crowe, Kevin Costner and Diane Lane also star. David S. Goyer penned the script based on a story he crafted with Nolan. Warners and Legendary turned to Nolan as a producer on the project after he successfully revived the Batman franchise with his Dark Knight trilogy. In the summer of 2005, Nolan's Batman Begins opened to $48.7 million and had incredible staying power. Man of Steel, while drawing mixed reviews, earned an A- CinemaScore, portending strong word of mouth. The pic skewed male (56 percent) and was fueled by older moviegoers, with 62 percent of the audience over the age of 25. IMAX theaters did big business, taking in $13.3 million (12 percent of the total gross) to likewise score the biggest June opening of all time. Overall, 41 percent of the revenues came from 3D screens. Overseas, Man of Steel is opening day-and-date in 24 markets, and is did huge business in the U.K. and Southeast Asia. The film's take through Friday was nearly $30 million, but full weekend numbers weren't immediately available. Coming in No. 2 Friday at the North American box office was Sony's innovative end-of-the-world comedy This Is the End with a stellar $32.8 million. The R-rated pic, opening Wednesday and marking the directorial debut of Seth Rogen and Evan Goldberg, has already made its $32 million budget back. This Is the End stars Rogen opposite Jonah Hill, James Franco, Jay Baruchel, Danny McBride, Craig Robinson, Michael Cera and Emma Watson. In comedy, the actors -- all playing fictional versions of themselves -- meet at a star-studded party at Franco's house when the apocalypse begins and they're forced to work together to survive. The film is based on a short film created by Rogen and Baruchel in 2007 titled Jay and Seth vs. The Apocalypse. Rogen and Goldberg also co-wrote the scripts for Superbad, The Green Hornet and The Watch. This is the End also features several other cameos during the early scenes at Franco's house party, including appearances by Rihanna, Mindy Kaling, Jason Segel, Paul Rudd and Kevin Hart. Sofia Coppola's The Bling Ring rung up strong business at the specialty box office as it debuted to sold out crowds in five theaters in New York and Los Angeles. The movie, from A24 Films, took in $210,000 for a location average of $42,000. It marks the director's best opening since Lost in Translation.